Today, you bring home your groceries (or order them delivered to your door). You preserve those groceries by putting the perishable ones into your refrigerator or freezer. Many of your ancestors did not have those luxuries. They used other methods to preserve their food. Very early ancestors, who lived in frozen climates, preserved their meat by freezing it on the ice. Those who lived in warmer, tropical, climates preserved their foods by drying them in the sun. Romans enjoyed a variety of dried fruits. Ancient Egyptians preserved their food by using salt. Sodium draws out bacteria-causing moisture out of foods. This dries the food and makes it possible to safely store meat for extended periods of time without refrigeration. In short, they made what we might call “jerky” today. In medieval times, after the spread of Christianity, people started using salt to preserve fish. Herring was the most common fish to be salted. It was very important to salt herring and preserve it as quickly as possible because it could turn rancid within a day after it was caught. Your medieval ancestors also used drying as a method for preserving oily fish (such as cod and haddock). Drying worked well in colder climates. The Norwegians prepared cod by exposing it to cool, crisp, air. They produced “stock-fish” – which were prepared for eating by pounding them, soaking them in water, and then cooking them. 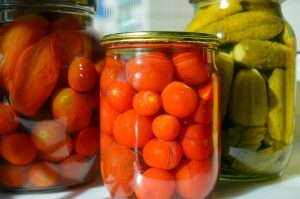 Canning was invented by Nicholas Appert in the 1790’s. He became known as “The Father of Canning”. It took him 14 years of experimentation to teach himself how to safely preserve food by canning it. Nicholas Appert’s method starts by placing food into sealed jars and heating them up to a temperature that kills bacteria and other microorganisms. As the jars cooled, a vacuum seal was formed that prevented other microorganisms from getting into the food. Appert’s method of canning was successfully trialed by the French Navy. Later, Peter Durand refined Appert’s method. Durand got the patent for the tin can in 1810. In the early 1800s, Frederic Tudor and his brother William got the idea to harvest ice from the pond on their estate and sell it in the West Indies. By 1864, everyone who had access to a frozen body of water was harvesting ice. By the early 1900s, families had iceboxes that were used to preserve food. The boxes required an actual chunck of ice to keep food cold.